We're commonly told that eating regular meals is a key to good health. This means at least three to five small meals per day, spread throughout the morning, afternoon, and evening. It stands to reason that your hormone levels, including growth hormone (GH), will suffer if you don't eat consistently. And having low GH slows your ability to burn fat, build lean mass, heal injuries, and get quality sleep. What Is HGH Pre-injection Intermittent Fasting? Pre-injection fasting means that one avoids consuming food or drink for a specified amount of time prior to taking HGH. Intermittent fasting adds another layer by letting you eat within an allotted timeframe. This eating window lasts for several hours, and you must consume all your food within this time span. You can choose whatever point in the day that you want to take in calories. For example, you can eat all your calories from 2pm to 6pm. The idea behind intermittent fasting is to deprive your body of its favorite fuel sources—carbohydrates (glycogen) and sugars—throughout most of the day. Glycogen, which is a starchy fuel source that's found in muscles, gets depleted while you sleep. However, Glycogen is stored as fat when your body has a surplus of food throughout the day. Considering that you won't have many carbs when waking up, your body instead uses fat for fuel. You can begin eating as soon as your feeding window begins. But intermittent fasters should wait at least one hour before eating following an HGH injection. The reason why is that your blood sugar level will be at its lowest point towards the end of your daily fast period, and HGH has the biggest impact when your blood sugar is at its lowest point. If your eating period is from 2pm to 8pm, for example, you’d want to take your HGH injection at 1pm. So, properly planning this diet in conjunction with your HGH injection routine can offer a dramatic increase on the effects of your growth hormone level. 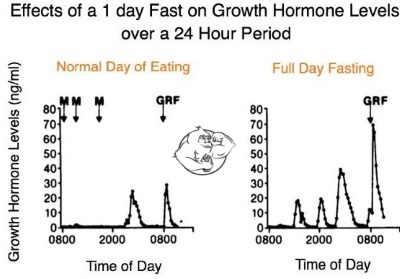 What does Intermittent Fasting Do for Your Growth Hormone? Research has shown that fasting can pump your GH level incredibly high. A 1988 study revealed that intermittent fasting causes a 2,000% spike in growth hormone after a 24-hour fast (1). The big GH increase lasted for two days after the fast. Researchers concluded that the growth hormone pulses came from the body’s response to perceived starvation. A 1982 study looked at people who undergo a 40-day fast due to Ramadan (2). Their GH levels increased from 0.73ng/ml to 9.86 ng/ml after a month, which is a 1,250% boost. Research from 1992 saw patients experience a 5-fold boost in growth hormone after fasting for five days (3). Based on the evidence, there’s definitely a correlation between fasting and GH spikes. Therefore, we can conclude that intermittent fasting provides many of the same benefits—even if you're not abstaining from food for as long. 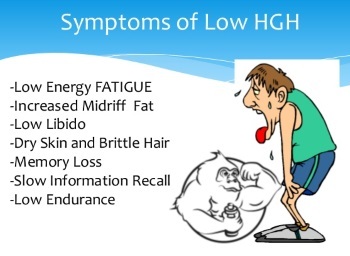 HGH provides the biggest increase in growth hormone over anything. This is especially the case when you take this drug when your blood sugar is low. Many athletes and people use HGH to burn fat quicker, make themselves appear more youthful, build muscle faster (through increased IGF-1), heal nagging injuries, and get better quality sleep. Imagine combining HGH with intermittent fasting—you’d see a GH boost like no other! 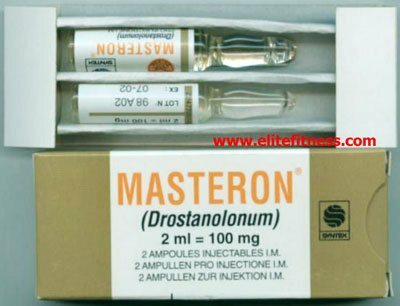 Of course, the key is that you need to use high-quality HGH, rather than the generic “blue tops” stuff. And you get this with Juvetrope, which is regarded as one of the top HGH brands on the market. Juvetrope comes with lab testing certification to verify that it’s 100% pure, pharma-grade HGH. You can goto juvepharma.com and get yourself a kit. Increased growth hormone isn't the only benefit that intermittent fasting provides. This form of dieting also boosts insulin sensitively. Insulin shuttles nutrients to different parts of the body. This includes glycogen, which, as mentioned before, can be stored as fat. But when insulin sensitivity is at its highest, your body uses nutrients in a more-efficient manner, meaning you can still build muscle and have energy when fasting. 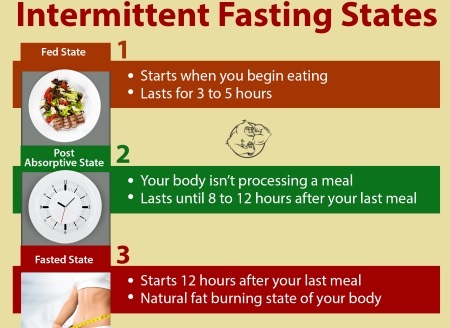 The biggest benefit from intermittent fasting is that your body begins using fat as its main fuel source. Additionally, you’re injecting HGH when your blood sugar is at its lowest point; therefore, it enhances the drug’s positive impacts even more. Moving to the downsides, intermittent fasting requires an adjustment period. Some people quit because it's so hard to go from eating throughout the day to only consuming food for 4-6 hours. Your mood will also change while you're going through this rough adjustment period—especially in the morning. Those who start every day off with breakfast will be in grumpy in the morning for the first few weeks. I've covered how much of a GH increase you can expect through intermittent fasting, and that you can combine this dieting method with HGH for the ultimate growth hormone level. Intermittent fasting forces the body to burn more fat as energy. This is especially the case if you work out in the morning, when your glycogen is at its lowest point. The body is then forced to dip into fat reserves to fuel you through the workout. And best of all, you get an increased amount of growth hormone to help you melt even more fat, gain extra energy, and build a great physique. That said, I encourage you to try intermittent fasting at least once to experience the benefits.